Blustery winds, sideways showers and icy temperatures are synonymous with Melbourne winters, which makes having lunch al desko seem not all that bad. But Melbourne's CBD is jam-packed with indoor oases just brimming with comfort food for the crisper months. So kick your keyboard to curb, pull on your winter woollies and take your pick from our selection of the best winter lunches in the CBD. 'Feel good food' is the tagline for grab and go concept store, Bluebag, which has four retail outlets across Melbourne. The fridges are bursting at the seams with sandwiches and salads but behind the counter is where the hot stuff happens. Soups include red lentil or chickpea and chorizo, but the real winners are the hot pots. The menu may vary from store to store, so if you happen to be at Freshwater Place be sure to choose the BBQ slow cooked pulled pork shoulder hot pot served with brown rice and coleslaw. It's sensational for a wintery workday lunch. It may be winter in Melbourne but it's summer in Spain, and Bomba is just the place to think warm thoughts and let your taste buds do the Flamenco with some tapas. The Spanish workers bar offers a $15 lunch menu where you choose from one of five 'tapa', such as tomato-rubbed bread with Serrano jamon, and one of three 'raciones' like braised calamari and chickpeas with cavalo nero. The $15 lunch deal also comes with a bit on the side; either patatas bravas or freekah and cauliflower salad with pomegranate. Fancy a trip to New York? So do we! But if it's as unlikely for you as it is for us, then settle for lunch at New York-inspired diner, Bowery to Williamsburg, instead. 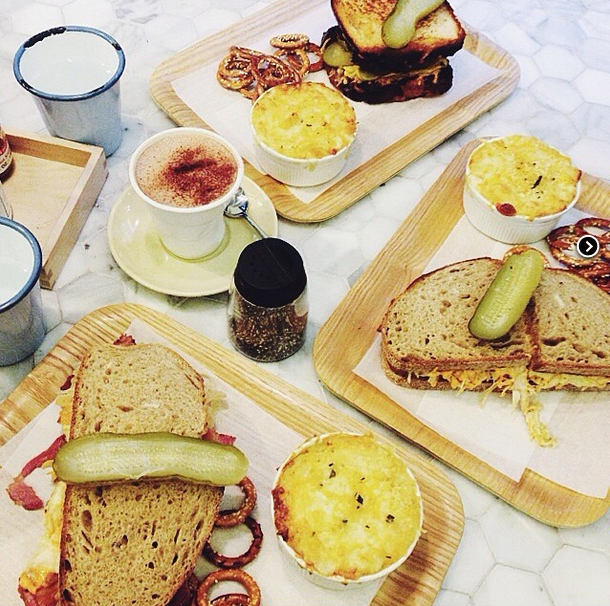 Here you will find pimped up, all-American sangas including The Reuben. The undisputed highlight of the lunch menu comprises of corned beef brisket, sauerkraut, Russian dressing and Swiss cheese. Team it with a side of mac and cheese, pretzels and a pickle for $16.50 and you've got the perfect combo to fill your tum on a winter's day. It's the home of the Melbourne Symphony Orchestra, but if concerts aren't your thing it's still well worth stopping by Hamer Hall to dine at all-day Italian bar and cantina, Fatto. With one of the best views of Melbourne's city skyline through its floor to ceiling windows, it's a cracking spot to kick back and enjoy a bowl of pasta or risotto for a winter lunch. The crab spaghettini with lemon, chilli, parsley and pangrattato (bread crumbs) is most certainly a highlight, as is the mushroom, sage and Parmesan risotto. Be sure to leave room for dessert and indulge in the chocolate pudding with hazelnut, gelato and salted caramel. Naughty, but oh so nice. And why not avoid the cold a little longer and stretch your lunch to Aperitivo Hour, when everyday from 5pm-7pm a selection of drinks are just $7 a pop. During winter in Melbourne there are those exceptional days when the sun is shining and the sky is a brilliant blue, ideal for that rare intake of vitamin D on your lunch break. Enter the food truck. Melbourne's love affair with food trucks reached new heights in early June when the City of Melbourne announced they could trade in the city outside of special events. Twelve trucks have been approved by the Council to operate in seven locations across town including Taco Truck, Banh Mi Boys and Mr Burger. So log onto wherethetruck.at to find out where your favourite will be and get truckin'! Off the beaten track down Equitable Lane between Collins and Little Collins Streets is a little Italian beauty, Fugazza, dishing up some of the best winter lunches in the CBD. The brainchild of owner Simon Michelangeli, Fugazza specialises in traditional Italian focaccias (fugazza), the recipes for which have been passed down through his ancestry. The standout fugazza is the eggplant parmigiana with roasted eggplant, grana padano and mozzarella cheeses, fresh basil and Napoli sauce, freshly baked inside artisan sourdough bread. But the winter warmers don't stop there; Fugazza offers superb meal deals where you can team your sandwich with one of their wholesome, homemade soups for just $10. 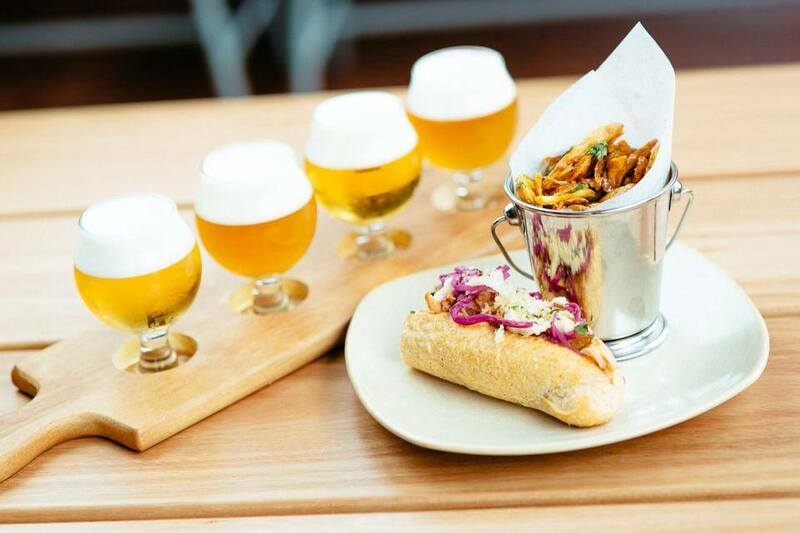 Hophaus is Melbourne's very own Bavarian bier hall located on the mid level of the Southgate restaurant and shopping precinct. The sleek drinking hole does Munich proud with its centrepiece polychrome bier bar featuring 30 draft bier taps. But the appeal doesn't stop at here. On a winter's day you can tuck into traditional German cuisine for a warming winter lunch, from the bratwurst with sauerkraut, smoked cheese and curry ketchup, to the 'wiener' schnitzel from the wood fired grill. Prost! Ask any Melburnian where you get the best dumplings in town and they'll invariably send you to HuTong on Market Lane, and it certainly doesn't disappoint. While their famous Shao-long bao is a must-eat, the wantons with hot chilli sauce and prawn dumplings are also particularly flavoursome. And if you're after something more substantial to warm you up on a winter's lunch break, HuTong's signature dishes are stamped accordingly to help you choose from the extensive menu. Tucked away in Midtown Plaza on bustling Bourke Street is Mister Close, where you'll find a glass cabinet full of home-style food that will warm you from the inside out. The beauty of this beauty is that the menu changes daily and is updated online every morning by 9am. Cold days are catered for with their selection of hot options, from soups and tarts to curries and meatballs. For service in a flash, simply pick up the phone and place your lunch order by 11.30am. Mr Tulk at the State Library of Victoria derives its name from the Library's first Chief Librarian, Augustus Henry Tulk, who spent 17 years building its extensive collection. Don't be put off by the scaffolding – Mr Tulk is well and truly open for business and serving up some delicious winter lunches that will warm the cockles of your heart. Our pick? The chicken and silverbeet pie with red wine sauce, hands down. Add a side of fries and a good book and you've got the perfect afternoon all wrapped up. Image credit: @nicoletj via Pho Nom Facebook. Melbourne's new Emporium is as much about the food as it is about the shopping, and we're heading straight to Pho Nom. 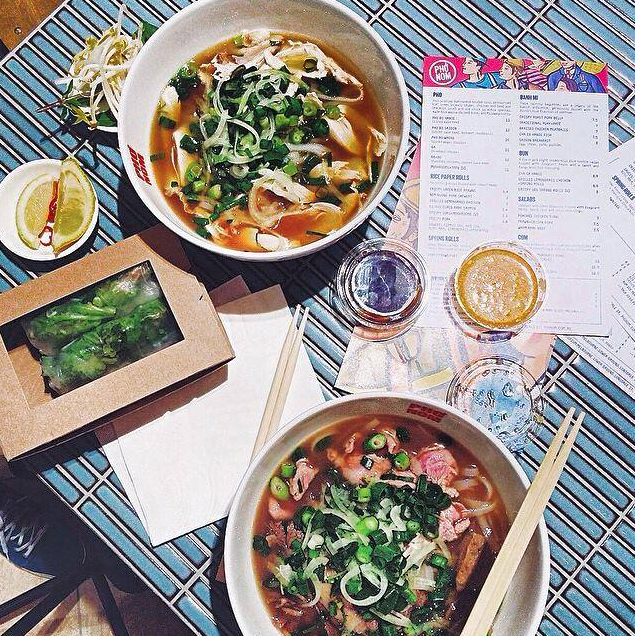 Your winter lunchtime woes will vanish with just one slurp of the pho on offer here. Choose from six varieties, including the Pho Bo Wagyu with sliced wagyu sirloin. Pop-ups just keep popping up in Melbourne, and one of the latest ventures in the city to form queues around the corner is Rue & Co. Located at the Paris end of Collins Street, Rue & Co brings together three stalwarts of Melbourne's dining scene and their exceptionally popular establishments – Salvatore Malatesta's St Ali, George Calombaris's Jimmy Grants and Chris Lucas's Kong. It's hard to make that all important winter's day lunch choice here, so for the sake of this snippet we'll break it down to three – the St Ali royale with cheese wagyu beef burger, the BBQ lemon and gochujang chicken ssam roti roll at Kong, and the Mr Papadopoulos lamb souva complete with chips from Jimmy Grants. Everything about The Grain Store makes you feel like you're dining in a cosy country farmhouse, from entering through the barn doors to the provincial counters laden with baked goods and pumpkins. With a focus on nutritious, locally-sourced produce, chef Ingo Meissner serves up rustic, hearty winter lunches like the Nicola potato gnocchi and brussels sprouts with butternut squash, brown butter, root chips and goats cheese flakes, and pork belly and spiced cauliflower on brioche with apple, kohlrabi slaw, cider raisins and chilli marmalade.